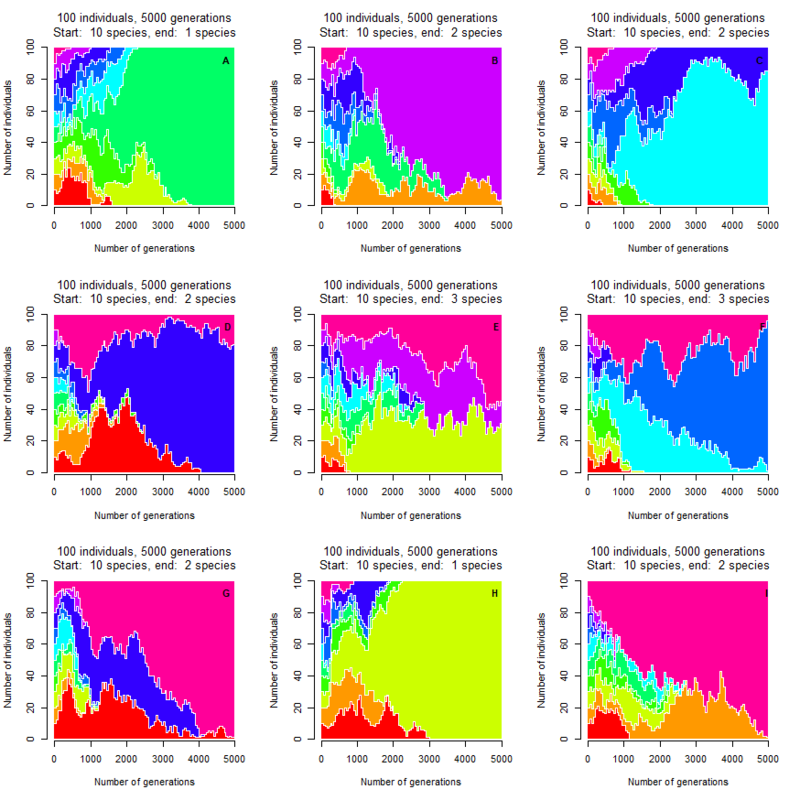 Visualizing random drift in ecological communities. Part 1. Ecological drift is one of the four main processes maintaining species coexistence in ecological community, along with selection, dispersal and speciation (Vellend 2010, 2016). To me, it seems that from these four processes, the effect of ecological drift on diversity and species composition of ecological communities is the least intuitive. Here I come with a few interactive illustrations and videos showing how the ecological drift works and what it does. I separated this post into two parts, forming a logical sequence. Here, in part 1, I focus purely on the random drift, without any other process in action. Destiny of all simulated communities is the same: eventually, only one species will prevail, and all other will go extinct, it is just a matter of time when. In part 2, I will also add dispersal and create a virtual landscape in which it matters who is your neighbour and how far your offspring can disperse. Then, I will also add selection, making species not ecologically equal and letting them search for their ecological optima. Combination of drift with dispersal and selection will be the most closely resembling the community assembly in real ecological communities, although being still very far from the situation in any real community. And hopefully, it will convince you that random drift is a process which can get more important than you would think. Imagine a small, tiny island – so tiny, that only 16 trees could squeeze in, not a single one more. The island is surrounded by sea, far from any mainland, perfectly isolated. In our example, we start with eight individuals of each species (red and black, see the figure below). A single process is happening: at any given moment, one individual dies and empties its place, and another individual reproduces, and its offspring fills the vacant place. The selection of individual which dies and which reproduces is random; it does not matter to which species the individual belongs or where on the island it occurs. See the illustration below. Random drift on remote island with 16 trees of two species. Yellow circle indicates species which has been selected to reproduce and whose offspring fills the vacant place. What happens after several cycles of die-reproduce-replace? Watch below. The population is small, so even a tiny fluctuations in units of individuals, in the end, lead to the extinction of one species (in this case the red one). If both species have an equal proportion of individuals at the beginning, the probability to extinct is equal for both since there is no difference between species and between individuals (species are ecologically equal, meaning that they have no fitness differences – they have the same probability to reproduce and survive to the next generation). Trend of abundances of two species in time, influenced by random drift. Less than 100 generations were needed in this case for one species go extinct from the island. Random drift on island with 16 individuals and two species, running for 300 generations. 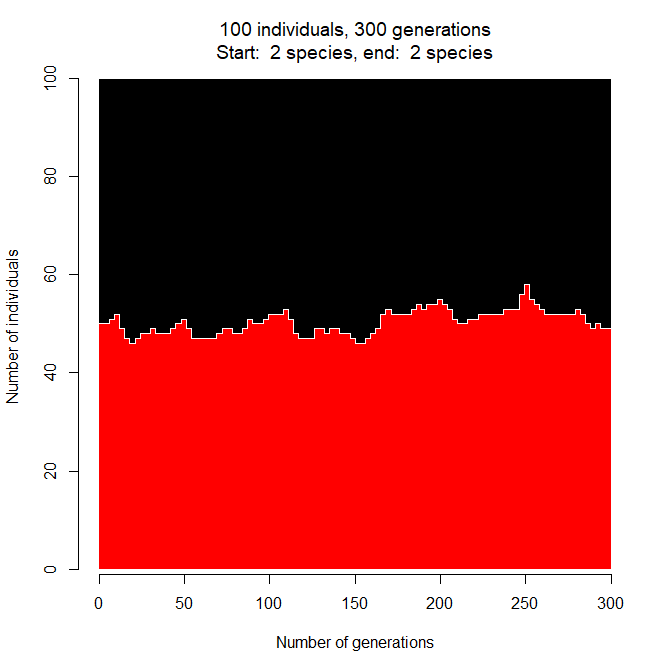 Note that I increased the number of generations from 100 to 300 in this multiple run example, to show that for most of the replicates this is enough time for one species to disappear from the island. Result in this case: in eight cases, one species extinct (in four cases it was red, in four black), and in one case still both species co-exist on the island. 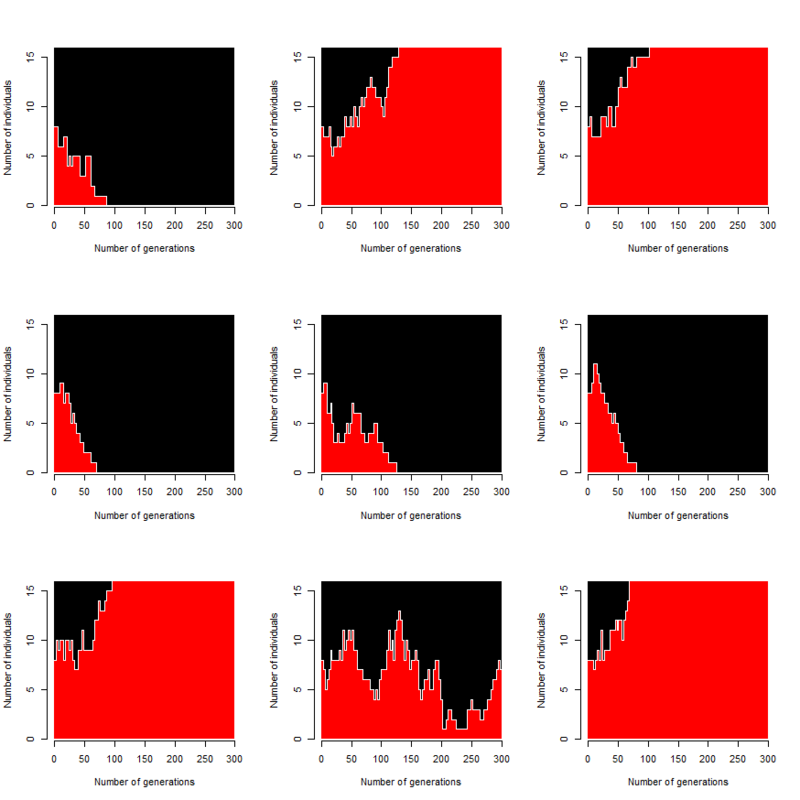 Note that the first panel (top left) is the same as the single figure above (with 300 instead of 100 generations). We can play further with this visualisation. How about a bigger island, say with 100 individuals? Random drift on island with 100 individuals and two species, running for 300 generations. Random drift on island with 100 individuals and two species, running for 5000 generations. The size of the population decides how fast the random drift will cause one of the species go extinct; more individuals need more time. But anyway, it is just a matter of time when the species will “drift away” of the community. Now, how about more species? If the community of 100 individuals is cut into ten species, the population of each species becomes rather small, prone to extinction. Random drift on island with 100 individuals and 10 species, running for 300 generations. Random drift on island with 100 individuals and 10 species, running for 5000 generations. 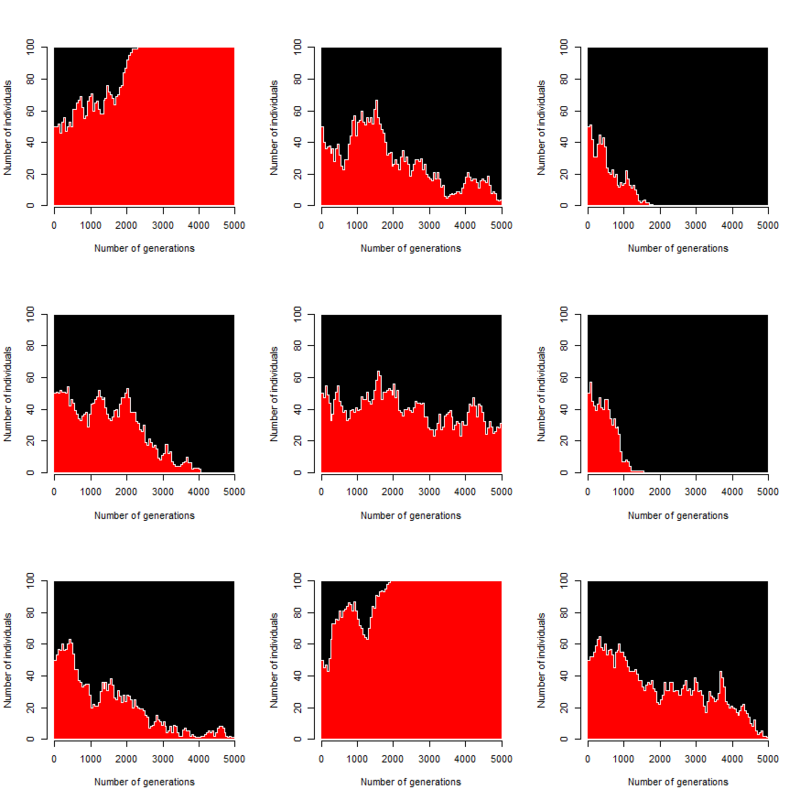 First 300 generations in each panel are identical with previous figure. 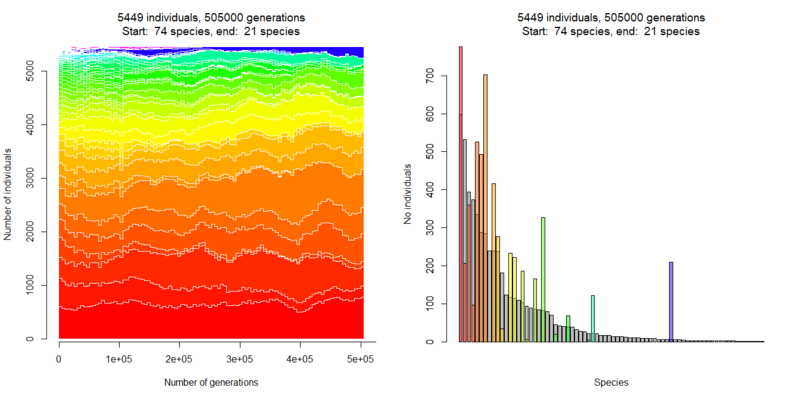 From the rainbow flag at the initial situation (after 100 generations, all species still have rather a similar number of individuals), after 5000 generations, all but one species eventually extinct. 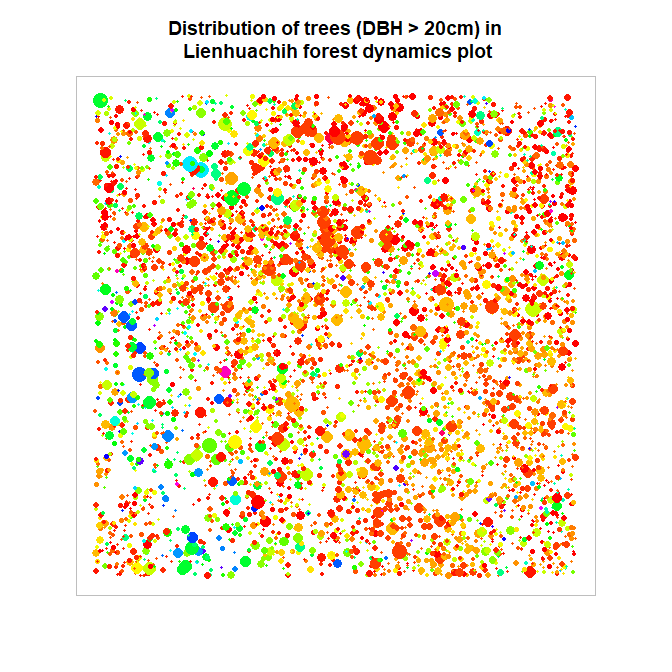 Distribution of individual trees (DBH > 20 cm) in the 25ha plot of Lienhuachih forest dynamics plot, Taiwan. The size of the circle is proportional to DHB of individual trees, and different color means different species. Liehnuachih forest dynamics plot. Photo credit: David Zelený. Random drift in forest with 5449 trees, 74 species and realistic species abundance distribution, running for 5000 generations. Seven species went extinct (mostly the rarest ones), but otherwise nothing too much is happening in such short time for such a big community. 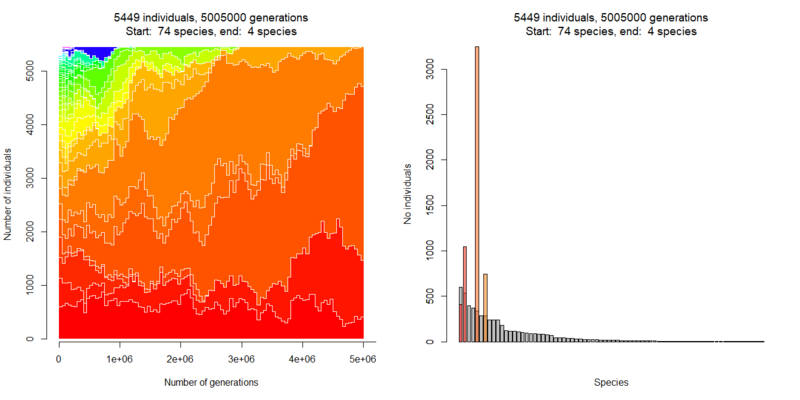 Note the new visualisation tool here: the left panel is the same type of figure you have seen already above (x-axis is time, y-axis is absolute number of individuals for each species), while the right panel shows species abundance distribution at the beginning (gray bars) and the end of 5000 generations (colorful transparent bars). 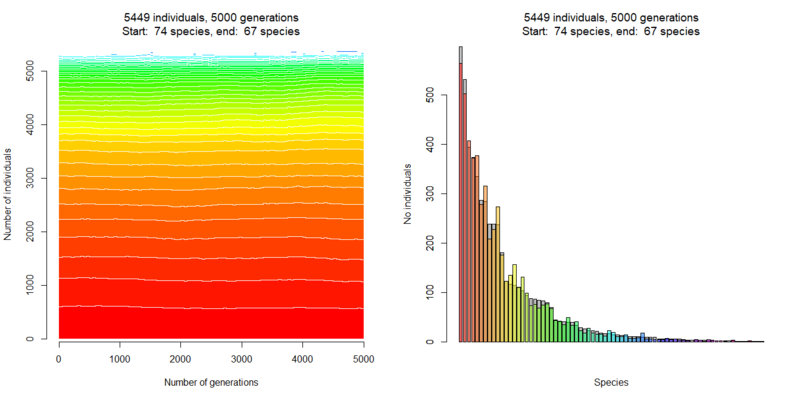 In the barplot, species are sorted from the most to the least abundant at the start of the simulation (i.e. 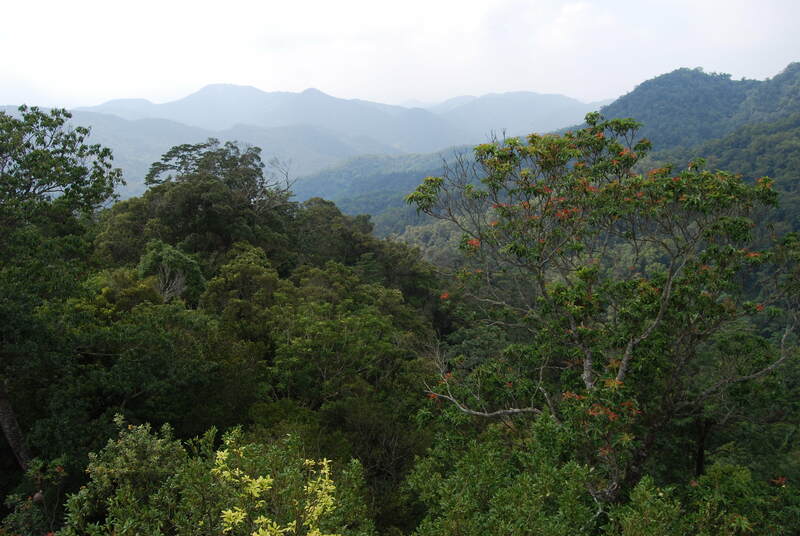 the tallest bar is Engelhardia roxburghiana with 599 individuals, the second tallest is Schefflera octophylla with 532 individuals). Random drift in forest with 5449 trees, 74 species and realistic species abundance distribution, running for ~50,000 generations. Random drift in forest with 5449 trees, 74 species and realistic species abundance distribution, running for ~500,000 generations. Random drift in forest with 5449 trees, 74 species and realistic species abundance distribution, running for ~5,000,000 generations. Time to try things by yourself. Below is an interactive application, in which you can play with random drift by yourself. By default, it creates a community of 10 species, 100 individuals and 1000 generations, and displays abundances of individual species by colours of the rainbow. 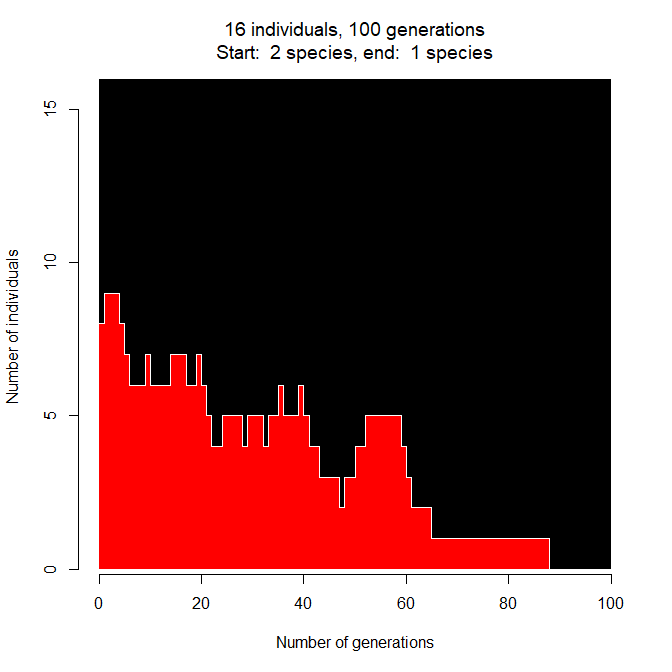 Feel free to modify different parameters; for example, set two species, 16 individuals and 100 generations to get the same scenario as displayed in the first figure of this website. Whenever you modify some parameter, the whole simulation is recalculated with new randomly generated values. If you want to stick to some version, fix the seed of the pseudorandom generator (set seed to YES); this will return the same generated community. You can calculate more than one (four or nine) scenarios in parallel. 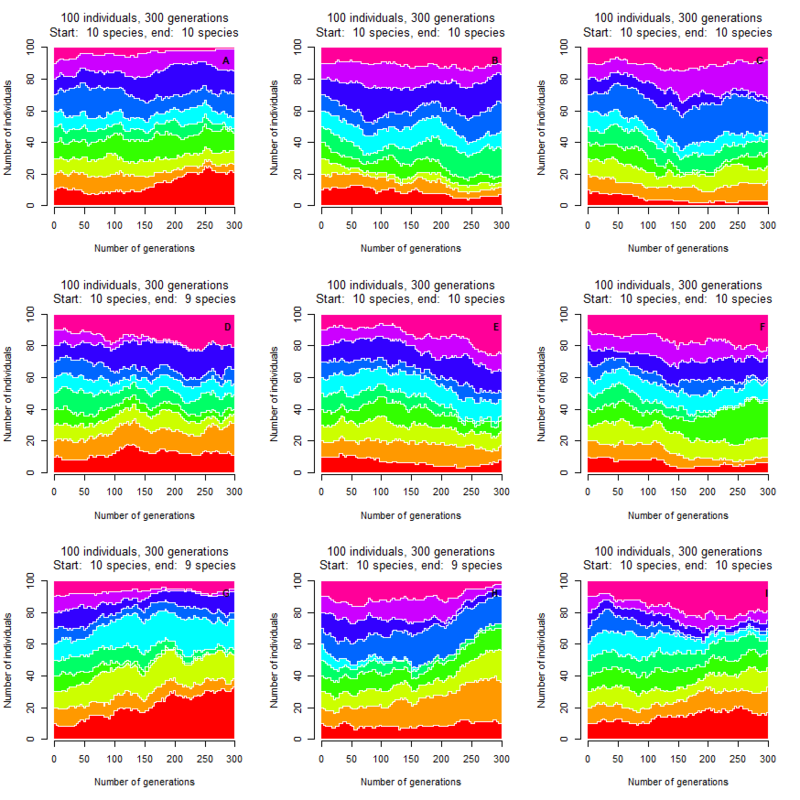 Everything on this website was done in R, using a relatively simple random.drift function. Originally I created this function as an exercise with students in my R for Ecologists class; it has been a simple function with two species from which one will eventually drift away, and the purpose was for students to practice how to do a loop and write a function. Eventually, I found it interesting to add an option to have more species and include more arguments to improve flexibility. See the definition of the function on my AnaDat-R website. Videos are not fully R-made – I used R to generate the sequence of *.png images but merged them into a video using Window’s Movie Maker. Hope in the future this can be replaced by some function in ”magick” package, which is a recent fresh import of ImageMagick into R (but seems not having all the functionality ImageMagick has). Yeh and GIF animations were done with package ”animate”, function ”saveGIF”; there are some shortcomings in this package, for example, while I can modify the width and height of the figure, I cannot modify the resolution and pointsize argument; or maybe it just needs to study more. Additionally to the R code, I also made Shiny application for the random.drift function, see the previous section. The background calculation is run in R on Shiny servers, and if you choose larger values, it may take a while to display the outcome. I got quite fascinated by the possibility to create such interactive apps; it is actually quite simple. More will for sure come in future. Vellend, M. 2010. Conceptual synthesis in community ecology. The Quarterly Review of Biology 85: 183–206. Vellend, M. 2016. The Theory of Ecological Communities. Princeton University Press. This entry was posted in teaching on November 13, 2017 by David Zelený.